It is my great pleasure to introduce to you my friend, Trish McCallan. I met Trish on Twitter about two years ago. Around the same time I met Eisley Jacobs, if you remember from her interview a few weeks ago. We used to post lines from our current manuscript on the hour with a hashtag of #wipfire Trish and I were on the same path at the same time, sharing our experiences as we worked on acquiring an agent We both knew the other was talented and figured it was a matter of time until we got our first book deal. Then coincidentally, around the time I was deciding to self-publish Twenty-Eight and a Half Wishes last May, Trish had decided to self-pub her book, Forged in Fire. Our connection grew tighter. Both of us were traveling on this journey of the unknown, and it was comforting to know that someone I knew was going through it too. For me, it was scary. How well would my book sell? Was I making a mistake? Was I killing my chances at a traditional publishing career? But it was exciting too. The chance to be in control of my own destiny instead of at other people’s mercy. Trish, you published your first book, Forged in Fire, last September. What were your goals when you published? My original goal was to make enough money in royalties to pay for the production costs of the next book I planned to self-publish. Forged in Fire shot up the charts after its release. This didn’t happen by accident but was the result of careful planning. What would you consider the number one reason FiF did so well? I’m certain the reason the book took off, was because of the guest blogs I did early in the book’s release. Those guest blogs started a word of mouth buzz. Quite a few of the people who bought the book off the guest blogs started chatting it up on Goodreads, Amazon’s reader forums and various readers’ loops. Nobody would have known about it without those early guest blogs. But price is a huge consideration in FiF’s success as well. Readers were willing to try it because it was so cheap. At $2.99 there wasn’t a lot of financial investment in a new-to-them and completely unknown author. If the book had been priced higher, I doubt it would have done so well. You caught some attention with your success. I’d received several agent emails through my website once FiF climbed to the top of the romantic suspense bestsellers list, but I had no interest in signing with an agent. My intent was to self-publish my work and I didn’t need an agent to do that. At that point I had no interest in going after a traditional deal. I felt I could make more money self-publishing. Then right after I hit my 10,000th sale I got an email from an editor at Montlake Publishing. (Montlake Romance is Amazon Publishing’s romance line) She said she’d read FiF, had loved it and saw tremendous potential for the series. She asked if she could call and speak with me about the benefits of partnering with Amazon Books. I already knew the benefits of partnering with Amazon. I watch the Kindle store and I’ve witnessed what happens to books when Amazon gives them a push. One email blitz can sell tens of thousands of copies and push a book to the very bottom of the Kindle Store. When the editor called and offered on the first four books in my Forged series, I accepted with no hesitation. Would you have been interested in a traditional book deal with a Big 6 publisher? No, for me a traditional deal was a poor business decision. For one thing, the royalty rates are peanuts compared to what I currently get. Add in the fact I would sell a lot less books because I wouldn’t be able to control the book’s price. A book’s price tag is what moves an ebook, particularly one from a debut author. People are willing to try me for $2.99; few would be so willing at $7.99-9.99. From watching the Kindle store it’s pretty clear that self-published titles are dominating the market. If the best selling traditional romantic suspense authors with their legions of fans couldn’t compete against the self-pubbed titles, what chance would a debut author have? Until the traditional houses raise their royalty rates and drop their ebook prices I planned to focus on self-publishing. About a month ago, you announced that you had accepted a publishing deal with Amazon’s romance imprint, Montlake Romance. So what made you decide to go with Montlake? Unlike so many of the traditional houses, Montlake Romance understands how essential price is to a book’s success. Their titles are priced to sell and consistently hit the bottom of the Kindle store. Add in Montlake’s higher royalty rates, monthly royalty reports and quarterly payments and they make more sense from a financial standpoint. But the deciding factor was Amazon’s marketing muscle. The Montlake titles have the full power of Amazon’s promo and marketing behind them. This is unbeatable. Every Montlake title gets the full treatment—the kind of treatment the traditional publishers only give to their mega selling superstar authors. Will you continue to self-publish books while you publish with Montlake? Yes, my plan is to continue selling my romantic suspense through Montlake, but self-publish select paranormal titles as well. Although, it will be a while before I’ll have anything to self-publish. I’m contracted with Montlake to produce two books a year. I’m writing full time now, but this is fairly new. I haven’t been doing it long enough to have a good sense of how many books I can produce in a year. Thanks for stopping by, Trish and I can’t wait to see how well you do with your new contract! You have until Friday, April 20 midnight CDT to answer. I Totally love eBooks. I have MS and with eBooks I can control font size, and with eBooks when I find a book I want I can get ti right now instead of going to book store. Thanks for the interview, Denise. Sandi, I love the ability to change font size. I also love being able to click out and check email without having to get up and use the computer. But mostly I love how much easier it is for me to read in bed, or the recliner. I don’t have to have the lamp shining just right . . .
Congrats, Trish, on signing with Montlake. Now that we are in the same ‘family’…we should get to know each other. But since I am AmazonEncore, and you are Montlake, maybe we are like those distant cousins who shouldn’t be, but indeed are in a competition to be the most successful, the prettiest and the most likeable? Seriously, though. Different imprints no competition needed, right? You will LOVE being an Amazon author. They treat us very well, I’ve been with them since 2009/2010 and the positives in the partnership have only been reinforced. I hope you enjoy the ride! I used to prefer print to eBooks and then I realized not to long ago that my feelings had switched somewhere along the way. I actually prefer eBooks!!! I have a new Kindle Fire and I love that I can fit tons of books on it and put it in my purse. And it’s great for traveling too. And yes! I highly recommend Trish’s book! Kay, thanks for stopping by and “meeting” Trish! I’m so excited to see she’s part of the Amazon family too! I would have to say ebooks. I like the convenience of having them all in one place. I didn’t really get turned on to reading until i got a Kindle. 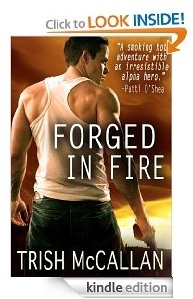 I fell in love with Denise’s books and after reading the interview I am off to get Forged In Fire! I definitely have to check this one out! I love that you both published at the same time, I had no idea! What an awesome interview ladies!! Congrats again to both of you. So proud of you both.